Welcome to Westie Rescue Ireland! Westie Rescue is a charitable organisation committed to rescuing and rehoming West Highland White Terriers in Ireland. Every penny donated goes directly to rescuing Westies, and everyone who gives time to Westie Rescue does so 100% voluntarily! 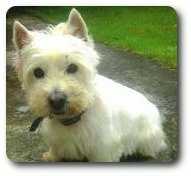 Westie Rescue is based in County Louth, Ireland and was set up in 2005 by Maureen Byrne, in response to the increasing numbers of Westies being abandoned and surrendered into dog pounds around the country. We take Westies from owners who can no longer care for them or want them rehomed. We get a full history on each dog: what sort of life he has lived to date, what people he has lived with, what level of training he has, what sort of experiences he’s had throughout life to date. We also take Westies who have been found straying and not reclaimed, and from pounds and other rescue groups around the country. We have no way of finding out the history of these dogs, and so they come and live with me, or go into foster care, until we get to know a bit about them. This is all done so that we can get a clear picture of what sort of home will suit each individual dog. Westie Rescue stands by every dog we rehome for the rest of his life. We are always available to offer help and advice to owners for the life of the dog. In the event that the dog doesn’t work out, or circumstances change, we insist on taking the dog back into the care of Westie Rescue. We rehome a lot of Westies that are indiscriminately bred by breeders who are only producing pups for money: they have no interest in the welfare of the dog, breed development, health and behaviour, or for the person who buys the dog. Once they get the money, that’s the end of their part in the deal. The same “breeders” crop up again and again for many of the Westies we get: we know who they are and are keeping records. The sunny southeast of Ireland seems to be the foremost area for Westie over-production, but they are not confined to the southeast. Such “breeders” sell their dogs via websites and free-ads papers, with dressed-up photos which do not reflect the true conditions the pup was reared in. These cheaper, often unregistered pups may be tempting, but buyer beware! These pups have had an impoverished upbringing and are more likely to develop health and behavioural problems. Westies are prone to a number of serious health issues which reputable breeders are trying to eradicate, but which back-yard-breeders and puppy-farmers turn a blind eye to: many aren’t even aware of these health issues. These Westies end up costing a fortune with vet fees, training fees, and a great deal of heartache for the unsuspecting owners. These “breeders” will tell you their pups are wonderful, great with kids, well-bred etc. Of course they’ll tell you the sun, moon and stars! By the time you find out they were lying, it’s too late. The pup is home and everyone loves him. In any case, buying these pups supports the uncaring, greedy “breeders”, and the cycle of misery continues. Please bear in mind that if you buy a pup from an unregistered or profit-driven breeder, you may feel that you are saving your pup from a bad situation. But by buying a pup from such a breeder, you are supporting the ill-treatment and over-breeding of your pup’s mother and many others like her, leaving her behind to continue supplying the conveyor belt of puppy production which your purchase has helped to fund. Westie Rescue is taking in more and more ex-breeding females which have been bred to near death from such establishments. Be under no illusion that these females are kept in atrocious conditions: Westie Rescue spends a fortune rehabilitating such females, and trying to get them back to full health. And whilst cute pictures of their pups sitting on plush cushions might have been posted online, these pictures are deliberately masking where the pups actually came from. Do not give these people your money. Don’t buy a Westie from just anybody: do your research and don’t buy a dog online! Better still, adopt a Westie instead!